what is the difference between the 2 green parties in Switzerland? 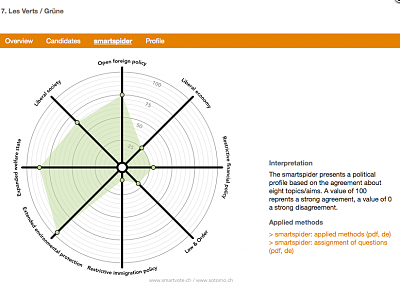 Re: what is the difference between the 2 green parties in Switzerland? The grüne party wants to save the world. The grünliberale party wants to save the world with an economically feasible plan. Nah. The green party is a green party, with all that implies (like having a constant battle between "fundis" [fundamentalists] and realists). The green liberal party is basically the FDP with a green condom that makes it a bit cooler for urban yuppie-wannabes. Its main advantage is that is the new thing, as nobody really knows what it stands for. The Green Party is leftist, in fact to the left of the SP, and favours state control. 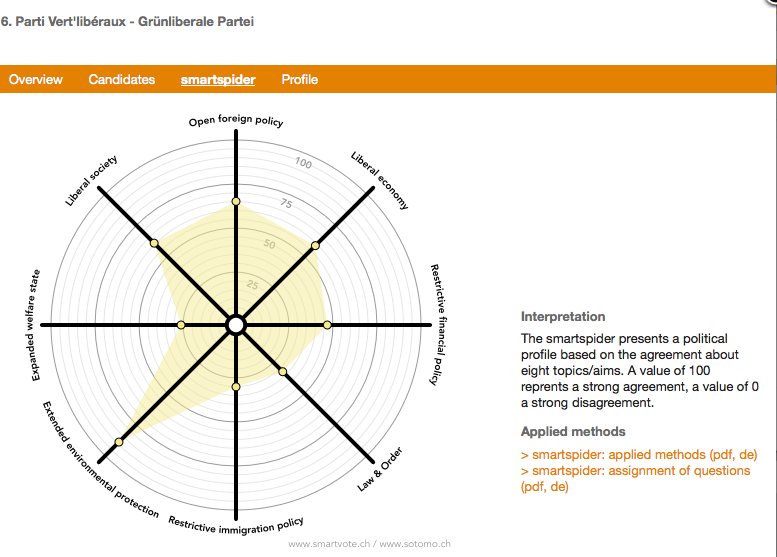 The Green Liberal Party is centrist, a bit to the left of the FDP, but clearly right-of-centre. Add to this that the Green-Liberals also tackle other topics and not just the "Green matter"
The Greens use environmentalism to hide the fact that they're just a bunch of commies. The Green Liberals use environmentalism to hide the fact that nobody really knows what they stand for. Sort of like a watermelon you mean, green on the outside, red on the inside. I would not go as far as to describe the Greens as Communists, as they are not Communists. Many former POCH members (e.g. Daniel Vischer) joined the Green Party when the cantonal POCH sections were dissolved back in the 80s and 90s and POCH was definitely a communist party. For them the Green party is basically a convenient cover because enviromentalism is much more popular than communism. The biggest difference between Liberal Green and the Green is that the later want to expand the welfare state and a less liberal economy. 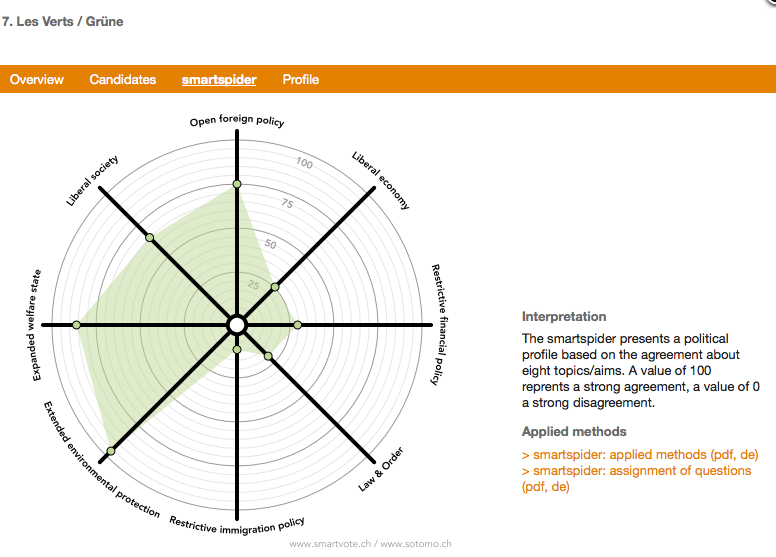 I use http://smartvote.ch to get the profile of the different parties and lists running for the federal elections. Here is for example the 2 parties profile for Fribourg canton. No, the GLP is not that far right. It is just narrowly left of the FDP. The GLP therefore, since its start, has damaged the results of the FDP. Well he might not have considered himself a communist but POCH clearly considered itself a communist party. Maybe not yet in 1970 but certainly later on. Die POCH verstanden sich zunächst als autonome Aufbauorganisation, später als Partei im Rahmen der Kommunist. Weltbewegung. To be fair, it was exactly 3 - Martin Bäumle (todays GLP President), Verena Diener (ZH Ständerat) and Thomas Weibel. They were actually excluded from the Green Party in 2004 for being "too far right". Although they may not sound like it today, if you look at interviews from back then, they seemed to be quite worried about their political future at the time and probably were quite surprised about the success of the Green-Liberals initially... They're laughing at it these days of course! SF has a nice timeline of the GLP (and all other big parties) on their webpage for all those interested (in German only). It does seem like the greens and the green liberals are drifting further from each other with time. At the last election in 2007, the GLP scored many votes from the left block - SP even withdrew their Ständerat candidate in favour of Verena Diener. Don't think that will happen this time - I think quite a few left voters were surprised how central-right the GLP turned out to be on non-environmental issues. Thanks for the info. This explains why he somewhat later suddenly left POCH. His father had left the PdA even before 1970 .